Save the Date for Boots and Bling! 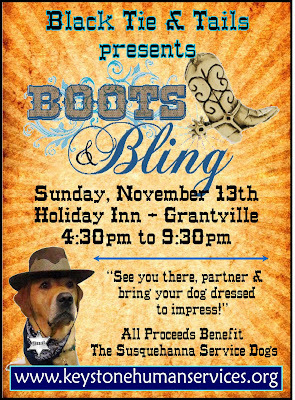 New this year, Black Tie and Tails presents Boots and Bling, a Western-themed evening for you and your dog! 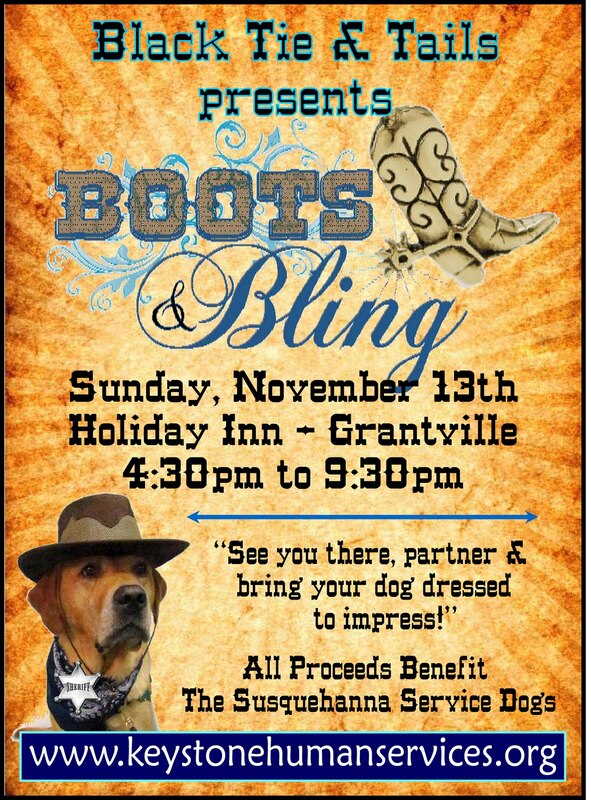 Come in your best Western wear or formal attire and bring your dog dressed to impress. We'll have live music, dinner, live and silent auctions and dancing for you to enjoy. And don't forget to have your portrait taken of you and your dog! For more information, check out Boots and Bling on our website. Our dogs in training took the train! 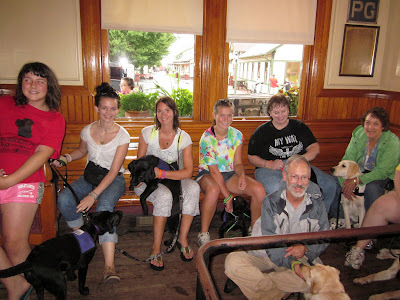 On Saturday, August 27, some of our puppies in training went to the Strasburg Rail Road. It was a cool, rainy day, but we still had a great time! 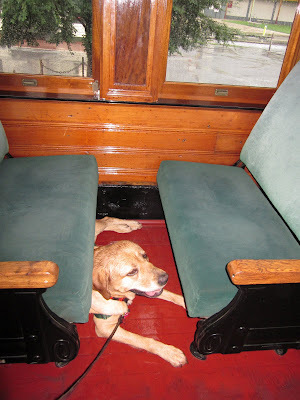 The Strasburg Rail Road was the perfect place for the dogs to gain some new experiences. Most of them had never been near a train before. Our puppy raisers and the dogs huddled under the station's overhang as the train chugged through the rain into the station. Even with all of the new sounds and sights, the dogs did very well. To get on and off the train, the dogs had to climb a few very steep steps. Our puppy raisers did a nice job keeping their dogs walking in a calm, controlled manner on the stairs. The dogs need to practice walking calmly on stairs because they'll need that skill with their future partners, and to prevent injuries to themselves. On the train, the dogs needed to fit themselves under the seats and relax for the 45-minute ride. Although the train made three stops along the way, we all decided to stay on board and out of the rain! 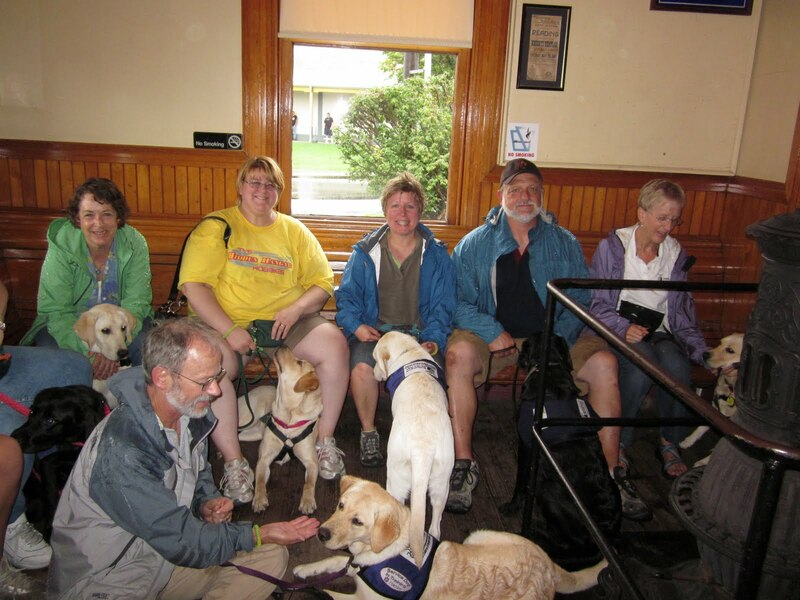 Thank you to the Strasburg Rail Road for donating tickets for our puppy raisers and for welcoming us to the station! We had a wonderful time, and it was a great learning experience for our dogs. 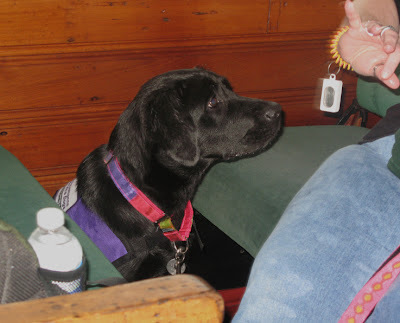 SSD Hale has been busy practicing lots of service dog behaviors. She has gone out in public to the grocery store, the mall, a tack shop, the bank and Pizza Hut, as well as a few nature walks and Fire Safety Day at Outdoor World in East Berlin, PA.
With all of this traveling, Hale has learned how to settle down nicely in the car. She no longer needs to be crated. 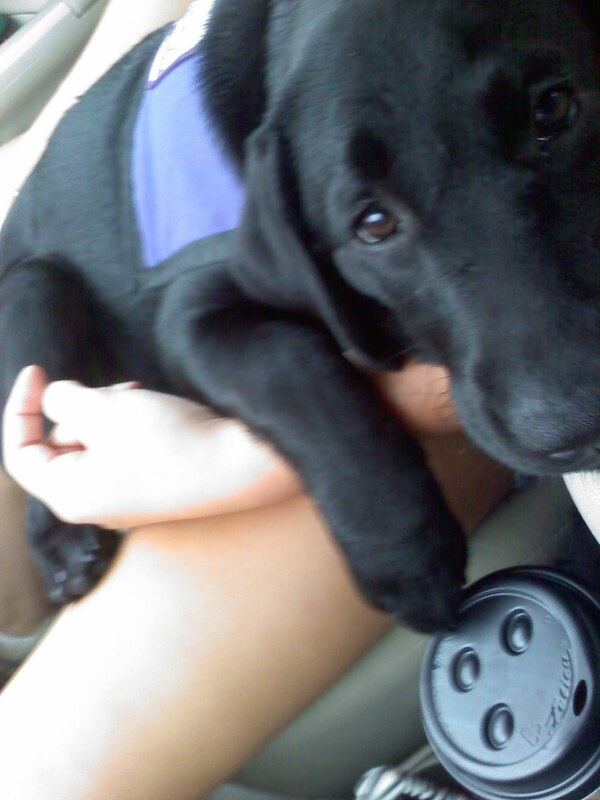 Instead, she settles down nicely in the front or back seat. Fire Safety Day included a BBQ fundraiser for SSD, and many of our demo dogs and dogs in training went. Hale met lots of older dogs, and she seemed to handler herself fairly well, although she did bark occasionally. There were lots of emergency vehicles on display, and Hale sat nicely by the Medivac. She wasn't even fazed when it started up and took off, although by that point, they were no longer right next to it. Because Fire Safety Day was located close to the Dillsburg Canine Spa, Donna stopped to see whether Hale likes to swim. The answer - nope! She was content to just get her feet wet. She did retrieve a toy from the edge of the water and bring it to Donna. She also got to run around with a large golden retriever and another large dog. She had a great time running with them, taking a few breaks to run behind Donna's legs. 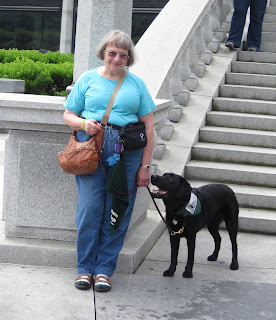 At the mall, Donna, Hale's puppy raiser, always takes time to work on stairs. Hale is very calm going up and down stairs, although she hops like a bunny on the way down. They also practiced entering the glass elevator. To safely enter the elevator, we train our dogs to wait while we block the door, then have the dog go on through on cue. By blocking the door, we ensure that the dog isn't going to get caught in the doors or that the doors don't close with the handler inside and the dog outside. Hale did well entering the elevator. A family with three little children got on after her, and Hale still did great! She looked at the children, looked out the window, and then focused all her attention on Donna. This is great progress for Hale. Children are a big distraction for her - she just wants to jump around with them! But she's learning that she can't play with all of the little kids she sees. She tries very hard to stay focused. Donna helps her out by staying focused as well and making sure she can't get to the end of the leash and reach the children. They also practiced "up" and "under" with the benches at the mall. 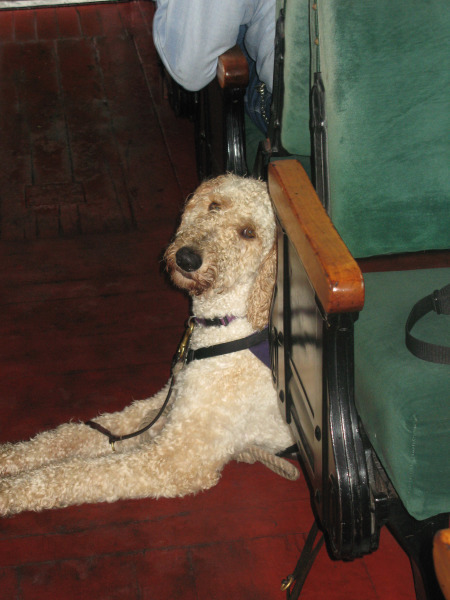 Hale needs some more practice with "under," but she loves the cue "up." Leave it and loose leash walking are two of the most important and challenging skills for dogs to learn, and Hale has been doing very well at both. Lindsey, one of her puppy raisers, can put a big pile of kibble in front of Hale while Hale sits about eight inches away. Even when Lindsey adds pieces of meat to the pile, Hale just looks at her. Hale also keeps her self control when Lindsey tosses a piece of kibble past her! She also walks nicely on a loose leash. Donna and Lindsey take Hale, Nubble (formerly SSD Nubble, but now a member of the family), and Gizzy for walks in the evening. Of the three of them, Hale is the best loose leash walker! Donna uses the evening walks to practice "leave it" with other objects, such as pine cones, worms, falling leaves, even Nubble. Yes, Nubble is sometimes a distraction for Hale because she loves to walk next to him and jump on him. Gradually, she is learning that it's not always proper to play with other dogs. 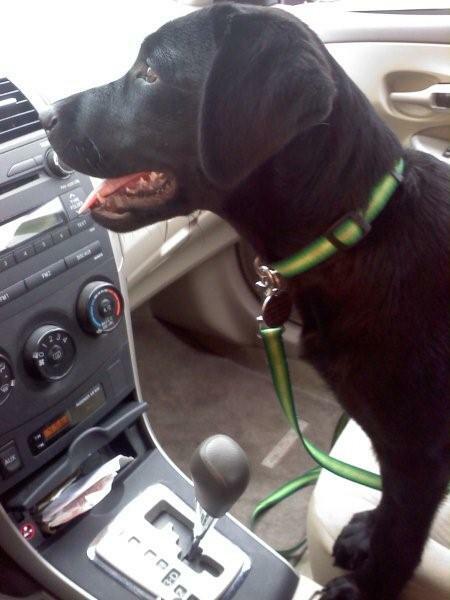 Hale has been learning how to play-retrieve - fun things like retrieving tennis balls and other toys. However, she's not really interested in it. Sometimes she runs right after the toy. Other times, she just looks back and forth between the toy and Donna. Sometimes she just sits on the toy and stares. From working on shaping skills, Donna has learned that when Hale gets frustrated, she starts offering any behavior, but then she just goes and sits on the object, whether it's a tennis ball, a bed, a box or her leash. When Hale is practicing her skills at home, Nubble and Gizzy will sometimes be in the same room, depending on how many distractions Donna thinks Hale can handle. During these training sessions when all the dogs are present, a curious thing happens. The dogs sometimes compete with each other! When Donna is working on "stay," Nubble and Gizzy compete to see who could stay the longest. "I would see them eyeballing each other to see who is winning," says Donna. This competitive streak has been very useful for training Hale. Hale learned by watching the other two. If she broke the "stay" but the other two stayed put, they got treats and she didn't. But if she stayed, she got treats. Donna used this same teaching method to work on proofing Hale's "stay." 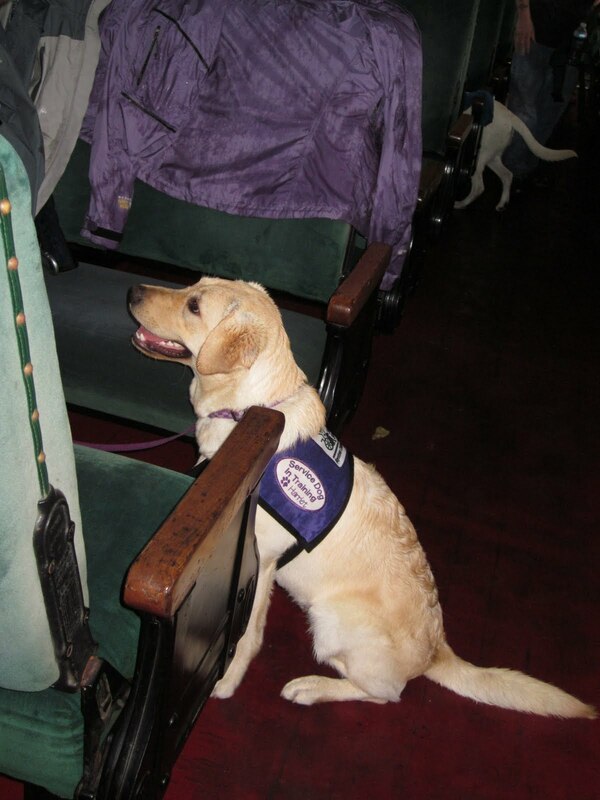 Service dogs often need to remain in a down-stay amid lots of distractions. When we train "stay," we also practice walking away from the dog, jumping around, clapping, stepping over the dog, etc. - all while the dog remains in a nice down- or sit-stay. At first, Donna couldn't do anything other than walk away from Hale. But then she put Nubble in a down-stay nearby and started walking around him and over him and clapping near him. After watching Nubble remain in a nice down-stay during all this commotion, Hale learned what she was supposed to do. Soon she was able to stay while Donna walked around her and over her. It's not perfect yet, but now she's off to a great start. Hale still doesn't seem fond of going into a down. She usually takes her time giving a nice down with a hip roll, or else she stays in a "sphinx" down (crouched with her back legs still underneath her). She also paws the ground sometimes, and when she does give a nice down, she plops herself down very dramatically. So far, Hale has encountered two objects that caused her some concern. The first was a fire hydrant. When she saw the hydrant across the street, she did not know what to make of it. Donna walked her over to it slowly while giving her treats. Once Hale realized that it was just a piece of metal, she was fine. (You may remember that Nubble was also unsure of fire hydrants the first time he saw them.) The other object was a child's stick horse that made galloping noises. The first time time she heard the noise, she jumped back. However, Donna was patient and gave her time to just sniff it when the horse was silent. Then Donna moved the horse away from Hale and turned it on. Hale just watched it. Donna gave her treats again, and then Hale walked toward the stick horse while it was making noises. In a little while, Donna could turn the horse on while Hale was close by and Hale didn't even care. Great job! 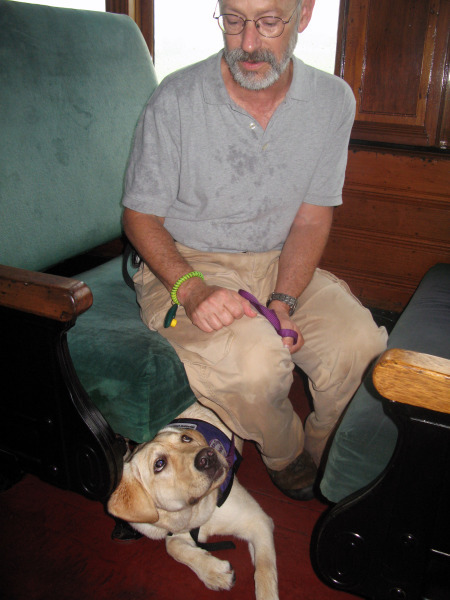 This Saturday, SSD and our dogs in training are going to ride the Strasburg Railroad. Hale will be coming, too! We will let you know what she thinks of her train ride. We received a question on our Facebook page asking fear and stress in dogs, and we think this is the perfect opportunity to talk about reading your dog and knowing your dog's stress signals. Do you know what your dog is telling you? Dogs speak with their bodies, and they're constantly telling us things. How well are you listening? When training your dog or even when you're out for a walk or hanging out in the backyard, it's important to pay attention to your dog's body language so you know whether your dog is relaxed and happy or stressed. As humans, we're very familiar with stress; we experience it several times a day, between traffic, deadlines, work, relationships, etc. Dogs are no different, although their stressors are very different from ours. Service dogs typically experience more stress than pets because they are being asked to enter new environments and perform challenging, specialized tasks. What is stress? It's anything that throws the body out of balance. Causes of stress include a sudden increase or decrease in exercise, changes in the environment, pain or illness and unfamiliar animals. There are several levels of stress, and dogs display different behaviors and body language for each level. When a dog experiences level 1 stress, which is a low level of stress, the dog may try to avoid the thing that is causing stress. The dog may also lick his nose or lips, sniff, scratch, yawn, play bow, shake or paw at things. What should you do if you see your dog doing these stress signs? You can give your dog more treats so they associate good things with the stressor. You can put some distance between your dog and the stressor or even remove your dog to a quiet place. This will help the dog calm down and help the dog trust you because he will learn that you will take care of him and remove him from scary situations. When a dog's stress level goes up, he may start panting, drooling, or even vomiting. He may get dandruff and bloodshot eyes, and his muscles will be very tense. He could also become extremely active or restless, drink excessively and develop sweaty paws. If you notice any of these stress signs in your dog, you should remove your dog from the situation. Give your dog a chance to relax. This may mean going outside to sniff for a while or maybe you give the dog a puppy massage. You will need to use your judgment about whether your dog will be able to handle going back into the stressful situation. It may be time to end your training session. Stressors can change, so situations that didn't bother a dog when they were 3 months old may suddenly cause them stress when they're 8 months old. However, with training, you can help your dog realize that they don't need to be worried or fearful in that situation. For example, let's say that a dog is afraid of people holding umbrellas. Whenever they see someone with an umbrella, they start barking and lunging. However, with training, the dog can learn that people with umbrellas are not scary and the dog will be able to remain calm and even interact with people with umbrellas. If a dog finds something very stressful, such as people with umbrellas, we sometimes use constructional aggression treatment (CAT). This type of training uses negative reinforcement, meaning a behavior is reinforced by the removal of the aversive or stressor. If the dog is barking or lunging at something, most handlers will remove the dog from the situation, which means that the dog learns that by barking and jumping, they don't have to stay in the stressful situation. When we use CAT, we're teaching the dog that the scary thing will go away if they give an appropriate alternative behavior, such as looking at their handler. We'll use the example of the person with an umbrella to explain the training. We start this training by having the dog in a fixed spot. 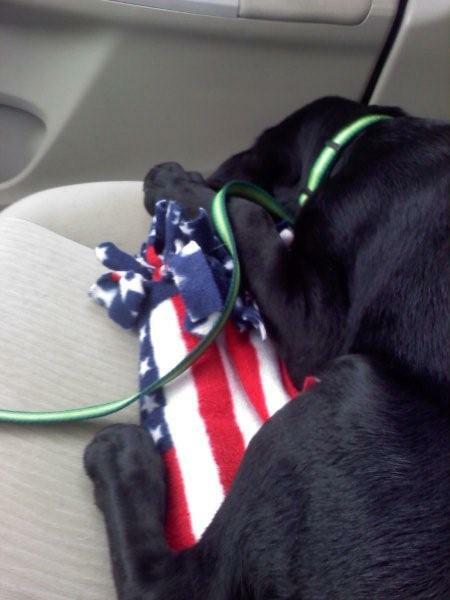 The dog can have toys, water, etc. around it. However, it's very important that you don't use any food or the clicker during CAT training because we want the dog to generalize the behavior regardless of whether their handler is wearing the treat pouch. Next, we have a person with an umbrella approach the dog to the point where the dog notices it. We don't want the person to get so close that the dog starts barking or lunging. 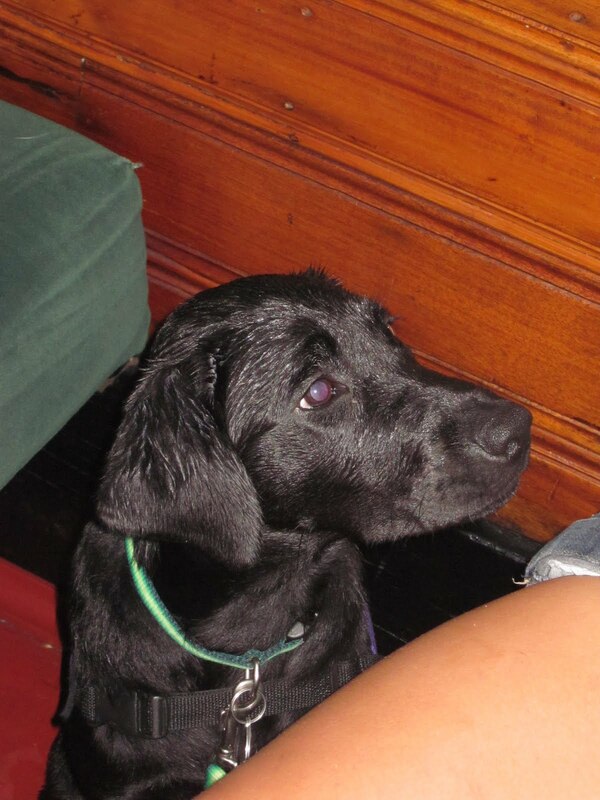 As soon as the dog sees the person and tenses up, the person stops. This person with the umbrella will stay in that spot until the dog gives an appropriate alternative behaviors, such as looking away, blinking, making eye contact with their handler, etc. As soon as the dog does that, the person with the umbrella moves away again to the point where the dog isn't bothered at all by him. Training continues in this manner with the person moving a little bit closer. The dog eventually learns that they can make the scary thing (in this example, the person with the umbrella) go away by being calm around it. At some point the dog may switch to being interested in the person with the umbrella. 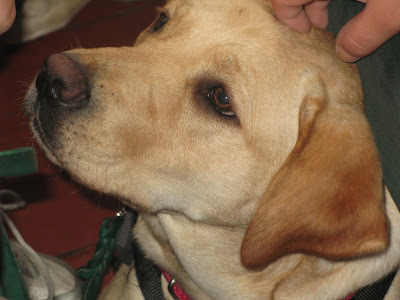 For example, the dog may sniff the air when the person comes forward. In this case, the person would leave as soon as the dog sniffs the air. Eventually, the dog will realize that people with umbrellas aren't anything to be afraid of, and they should be able to remain calm and relaxed whenever they see a person with an umbrella. During this whole process, you will need to pay very close attention to your dog's body language. 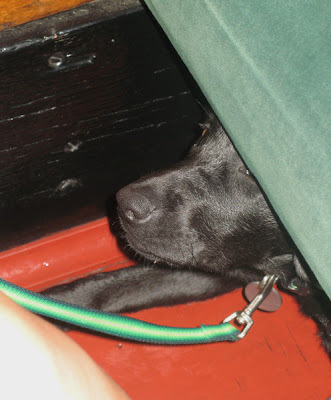 You will be looking for very small signals from your dog - a head movement, a blink, a deep breath, etc. It takes patience, but if you pay attention to your dog, he will soon be able to remain calm and relaxed in stressful situations. What's the Difference Between Service Dogs and Therapy Dogs? It's International Assistance Dogs Week, an entire week devoted to recognizing and celebrating assistance dogs and everything they do to change their partners' lives! The rest of the week, we're going to post stories of service dogs and training tips, but today, we want to make sure that everyone understand what a service dog is. There are so many different types of assistance dogs that it can get confusing. 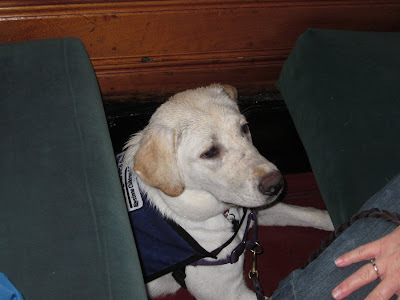 Guide dogs, service dogs, hearing dogs, balance dogs, psychiatric service dogs, seizure response dogs, facility dogs, diabetic alert dogs - there are even dogs who have been trained to detect peanuts for people who have life-threatening peanut allergies! (Please note that this isn't a comprehensive list of the types of assistance dogs.) Each of these dogs is trained in specific tasks to assist their partners. Assistance Dogs International (ADI) defines some of these types of assistance dogs, if you're interested in more details. Today, however, we would like to discuss the difference between service dogs and therapy dogs. People often mistake therapy dogs for service dogs and vice versa. According to the ADI website, a service dogs is "a dog that works for individuals with disabilities other than blindness or deafness. They are trained to perform a wide variety of tasks including but not limited to; pulling a wheelchair, bracing, retrieving, alerting to a medical crisis, and providing assistance in a medical crisis. " Service dogs are covered under the Americans with Disabilities Act (ADA). They are working dogs, not pets, and each dog must be trained to perform specific tasks for their partner. Under the ADA, service dogs have public access, meaning they can accompany their partner anywhere that is open to the general public. This includes restaurants, movie theaters, grocery stores, and other businesses and nonprofits. Legally, access to public places cannot be denied unless the dog is out of control or not housebroken. Read the ADA's revised requirements for service animals for more information about service dogs and the law. A therapy dog is a pet that has been trained to provide affection and comfort to people. Therapy dogs often visit hospitals, nursing homes and schools to interact with the children and adults there. However, therapy dogs are not mentioned in the ADA and do not have public access. They must be invited to enter a public place, and business owners are well within their rights to ask a therapy dog to leave. Emotional support dogs are similar to therapy dogs. While it may comfort their owners to have the dog with them, emotional support dogs are also pets that are not covered by the ADA and do not have public access. 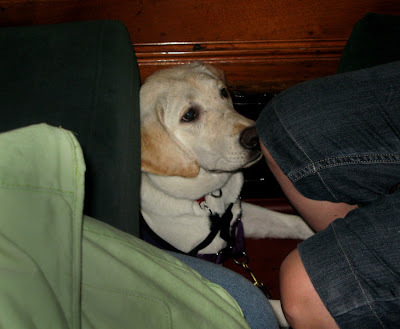 How can you tell if a dog is a service dog? 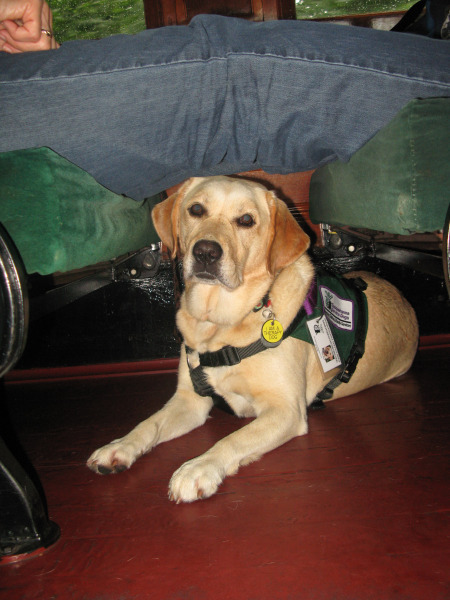 Service dogs often wear a special harness to show that they are service dogs. 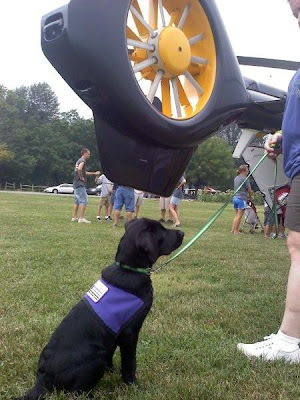 However, the ADA does not require service dogs to be identified by a harness. 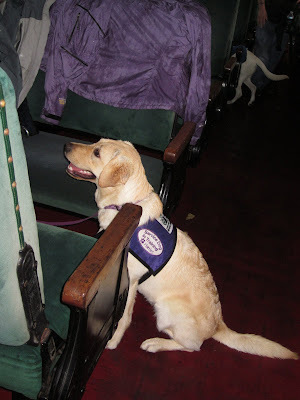 If you aren't sure if a dog is a service dog, by law you are allowed to ask two questions: 1.) is the dog a service dog required because of a disability, and 2.) what specific tasks has the dog been trained to do. You may not ask the person what their disability is, ask them to have the dog demonstrate a task, or ask for documentation for the disability or service dog. Can you pet a service dog? 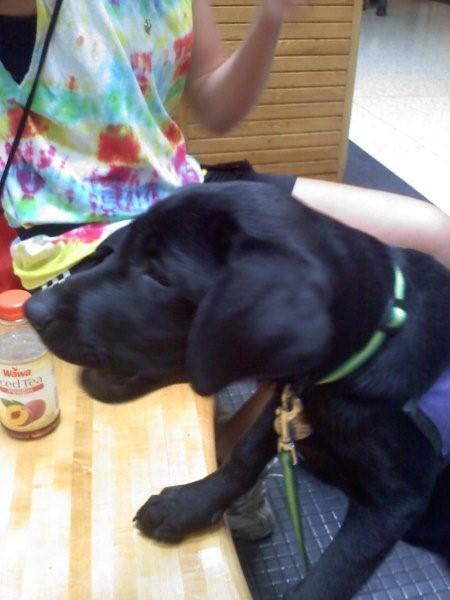 Please do not pet, feed or otherwise distract service dogs. Remember that they are working and must concentrate on assisting their partner. 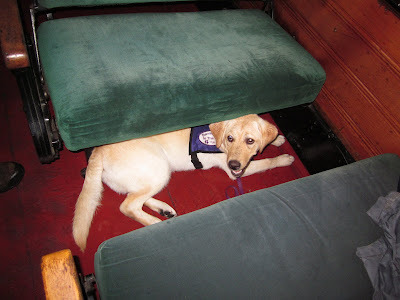 If you distract a service dog, you could even endanger the dog's partner. The Norwegian Association of the Blind did a great public service announcement about the importance of not distracting assistance dogs. You may, however, ask the person if you may pet their dog. Many times, the person will say yes, although they may make sure that the dog stays focused on them. Please don't be offended if the dog ignores you while you're petting it. This is actually a good thing! It means that the dog is most likely still focused on its partner, which is exactly what it's supposed to do. If you ask to pet a service dog and the dog's partner says no, please respect their decision. Can you talk to someone with a service dog? Of course! 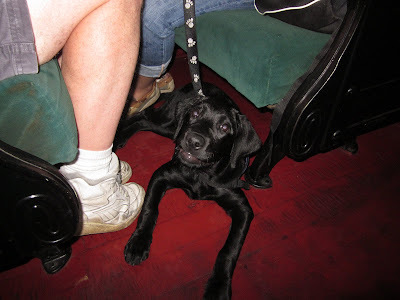 People who have service dogs or who are training service dogs are often more than happy to talk to you. But please talk to the person and not the dog. After all, the person is the one who is going to answer you! Next week is International Assistance Dogs Week! All next week, we will be celebrating with a series of posts about service dogs, training tips, and photos of working dogs. If you have questions about service dogs, public access or anything else related to service dogs, just leave them in the comments. We'll do our best to answer them. Your question may even provide the inspiration for a blog post! Check back on Monday for a discussion about the difference between service dogs and therapy dogs! Don't forget to check out our Facebook page. We'll post additional training tips and photos. If you have a service dog or are training a service dog, we would love it if you posted a photo or shared your story with us on our Facebook page!